In 2001, they coated yeast protein fibers with gold and silver atoms, which let the fibers conduct electricity. The fibers are just a few nanometers — a few billionths of a meter — wide. These so-called “nanowires” are useful in very small electronic circuits such as faster computer chips. Some diseases — such as Alzheimer’s and Parkinson’s disease — are caused when proteins in the body don’t fold properly. Some misfolded proteins coax other proteins into misfolding and sticking together. This forms long, thin protein fibers. Susan Lindquist is director of the Whitehead Institute in Cambridge, Massachusetts. She and her team were studying proteins in yeast that form similar fibers. They realized that these fibers could actually be put to positive use. Susan Lindquist: And we thought, well, instead of trying to build something from scratch using chemistry and try to figure out how particular molecules might come together, take advantage of mother nature, who has already figured out how to do this and use this protein to self assemble . . . interesting devices. Lindquist’s team is now trying to learn more about how proteins form these fibers. She also hopes the work will help fight diseases caused by misfolded proteins. When something has been a problem for a long time, mother nature can often take advantage of that problem and turn it to her own use. So we work on certain aspects of altered protein folding that can be beneficial. And then we got into this nanowires thing out of that because we thought well, as we began to study this one particular protein and how it folded, we actually could watch it folding and misfolding in a test tube and we realized it had some very special properties and we thought we could take advantage of it. And that’s where the nanowire stuff came from. So the global thing in my lab is how proteins fold, how they misfold and what the consequences are. I understand you do a lot of administrative work and oversee many other researchers. But I’m interested in what research you’re working most directly with. Do you spend much time in the lab? No. It’s been unfortunately a long time since I’ve been working at the bench myself. I used to really enjoy working at the bench. But now I get to watch other people do it and I just basically get to talk to them about their experiments and help them plan them out and help to come up with strategies. I do have quite a lot of administrative work to do at the Whitehead. But one of the reasons I was willing to take this job is that it really — Whitehead has a real philosophy that if you’re going to be a director or administrative science — especially for a small to middle sized organization like ours with just 16 faculty members like ours, that you can do a much better job of it if you’re still very active in research. So they’ve done a lot to be sure that I can maintained my lab and maintain my research interests because any many ways, that’s the thing that keeps me really psyched up is the research we’re doing. 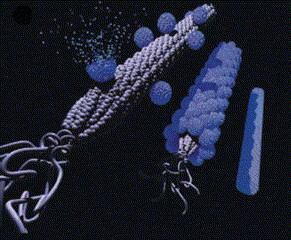 So as I understand it, you discovered a protein that folds up in a certain way and starts a chain reaction that folds up other proteins, this eventually leads to creation of a fiber with special properties (self-assembling, stable, 10 nm wide and can be modified to have different properties – making them into “nanowires”). So how did you discover this protein? And how did you find out that it could do this? It turns out that a very bizarre pattern of inheritance was discovered in that organism [yeast], oh, about 40 years ago. For certain, particular traits, they were not inherited in the way the vast majority of other traits were inherited. In more recent work, that has turned out to be that the trait was inherited because of a self perpetuating, protein conformational cascade, rather than inherited in the way that most changes are inherited, when you change the nucleic acid or the DNA, you’re going to of course, change the organism’s genetic code, you inherit a new trait. It turns out that this could not be tracked to any change in DNA whatsoever. And it turned out to be due to the fact that there’s certain proteins in these organisms … that can undergo a change in conformation that’s catching, if you will. What happens is that proteins normally fold up into these highly structured things where they keep their sticky residues on the insides. But certain proteins have a flexibility and they can sometimes expose those sticky residues. When they do, they can act as a sort of trap that will cause another protein of the same type to stick to it — and the way it stacks on to the other protein, it turns out that it creates yet another surface on which another protein of the same type can add. So it’s sort of like once the domino goes — boom, boom, boom — all of these other dominoes wind up falling too. It’s the same way with this particular protein too. Once you get it going into it’s misfolded state … what you wind up having is long strings of this protein. And they’re passed on from mother cell to daughter cell. And the reason you get an inherited trait due to this change in protein folding is that when the mother cell divides, the daughter cell winds up getting a little of this protein too. So that when she starts making her own proteins … those proteins are going to be sitting in this same cellular environment where there’s this altered protein and they’ll get trapped and go along for the ride as well. And it just goes on for generation, after generation, after generation. So we were able to duplicate that all in a test tube a few years ago. And when we looked at the fibers that these proteins made, we realized that they had some unusual properties. They’re very tough fibers — for example, they’re resistant to detergents and they’re resistant to organic solvents. You can boil them, you can freeze them and they pretty much retain their full structure. In fact, they’re amyloids — they’re the same kind of tough fibers that appear in the brains of people who are suffering from neurodegenerative diseases. And that’s sort of one of the ways in which they vary different lines of work that we’re doing in the laboratory connect. Anyway, we thought, gee, these fibers are very neat. They self-assemble. We can trigger the assembly any time we want. They self-assemble very rapidly, very faithfully. They’re very tough and they’re tiny, that is they are very, very thin — they’re 10 nanometers thin. And that’s really thinner than we’ve ever been able to manufacture devices through any mechanical process in the past. So we thought maybe these things could be useful for manufacturing little nano-scale devices — nanoscale device building has become kind of a buzzword now. It’s really an interesting challenge trying to get things smaller and smaller and smaller. And we thought, well, maybe instead of trying to build something from scratch using chemistry and try to figure out how particular molecules might come together, take advantage of mother nature, who’s already figured out how to do this, and use this protein to self assemble interesting devices. And so we’ve just taken the first — what I would call — baby steps. But on the other hand, sometimes the baby’s first steps are pretty exciting. And what we were able to do was to put a reactive group on these protein fibers that we could use to attach tiny, little, itsy bitsy gold balls to. And these gold balls are just a few atoms of gold across — they’re very tiny. And then we were able to use a reductive plating mechanism to get silver to deposit along these little tiny droplets of gold that were on these tiny little protein fibers. And basically, with silver and with another layer of gold, we were able to make a solid metal coating on the outside of these fibers and we thought that might be able to conduct electricity. Nature has really been operating for a few billion years here to create proteins that have extraordinary capacity to do all sorts of interesting things — harvest light and change its energy, change the oxidative-reductive state of things, or convert one molecule into another molecule, break it apart or break it open, put things together, etcetera. So you can imagine — sort of a fantasy, but — you can imagine being able to build these tiny, tiny little wires made of proteins that have all sorts of interesting protein chemistries integrated into them — to do things on a scale — very, very complex things — on a much smaller scale. When I give a talk about this, I sometimes go back to a Popular Mechanics issue from about 40 years ago where they said that some day computers might be small enough to fit inside a house. And it was sort of wild speculation and now of course, they’re not only small enough to fit inside a house, they’re small enough to fit inside the pocket — and the question is, how much smaller can we go? Why do you need the proteins to make nanowires? Why not just make them out of metal? Theoretically you could. What we’re doing is taking advantage of the protein because the protein provides this template — it provides a nice, long, very thin, very straight unbranched template. And in fact, we can make it branch and cross if we want. So we can build in functionality that can have them cross-link themselves across the fiber if that would be an advantage. So one, you could imagine you could throw a bunch of gold balls … and maybe sometimes they would line themselves into fibers, and maybe on could come up with ways to make them align, but it’s not easy. This protein already has built into it — because of it’s a biological property that’s been built into this protein — which it just self-assembles with incredible accuracy and incredible speed. So the idea is just to take advantage of it. What new aspects are you working on with nanowires? We’re working on what the structure of the fiber is. Which parts of it are floppy, which parts of it are accessible, which parts are buried — we’re working on how the assembly actually takes place. How does one protein recognize it’s supposed to associate with another protein? The specificity of the assemblies is really quite remarkable. So we’d really like to understand how that specificity is maintained. We’d also like to understand how — on a microscale, the fibers can take on slightly different forms and once they take on slightly different forms, they self perpetuate — we’d like to figure out how that works. So what motivates your work? Being able to understand how these fibers assemble is actually, from our standpoint, the driving force as we’re really interested in the biology and how this can actually serve as a mechanism for inheriting a biological trait. So the more we learn about the proteins and fibers and the self-assembly, it feeds into our biological interests as well. How did you get into the nanowire work? Well, the original discovery that there was this weird pattern of inheritance of red and white colony color in yeast was made by Brian Cox about 40 years ago actually. No one knew it was protein based until a geneticist … was looking at the patterns of inheritance and suggested that, well, this just can’t be explained by normal genetics. Maybe it could be explained by a self-perpetuating protein state — that was about 10 years ago. And then we happened — it was one of these lucky relationships where we were working on protein folding and we, it turned out were working on a factor that turns out to control this red — we were working on it for totally different reasons, but it also happens to control this red/white switch — so we started doing a lot of biochemistry and cell biology on it … in collaboration with Gary Chernoff and Susan Liebman — oh about 10 years ago — 1994 was our first paper. So it’s been going from yeast inheritance to nanowires took us about 10 years.